The close-backed ATH-A700 outperforms its open-backed cousin in every way, seizing a deserved spot at the top of the heap for this price range. A close cousin to Audio-Technica’s ATH-AD700, the ATH-A700 read as if they are simply the close-backed version of the same headphone. On closer inspection however, we discovered several key differences which help to earn the A700 a much higher rating than the rather disappointing, open-backed AD700. In our review, we hone in on these key differences to expose what makes the A700 a far superior buy for just $20.00 more. As with the AD700 headphones, Audio-Technica has foregone premium packaging efforts in order to keep the cost of the A700’s down. The headphones are packaged in a rather simple box. Just like the AD700, pulling back the Velcro-secured door reveals the headphones behind a clear plastic window. Alongside the cans is a single 1/8-inch to ¼-inch adapter for use with home audio and studio equipment, but that is all — no storage pouch or case. Unlike the AD700, the A700’s forego a flashy purple ear-cup backing in favor of a deep midnight, blue which is so dark that, from a distance, it would be easy to mistake for black were it not for the tasteful metallic fleck accents. As a result of this superior finish, the headphones exude a class that went missing from the AD700. 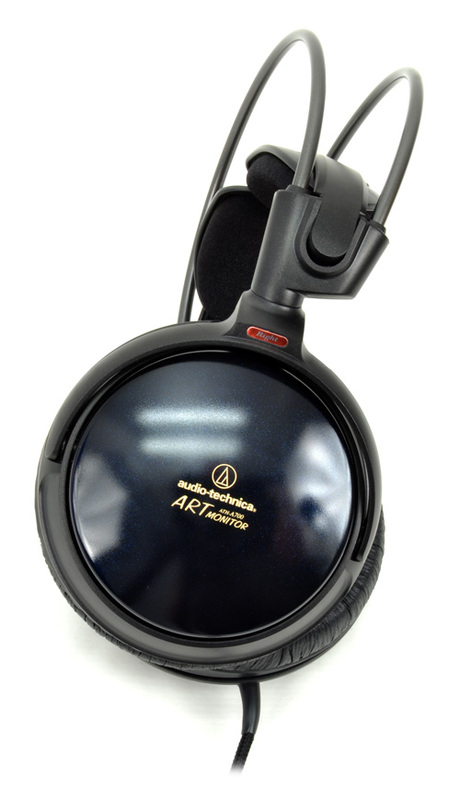 The ATH-A700’s utilize a large 53mm driver that is angled back toward the ear from within the ear-cup. The inside of the ear-cup is heavily padded, and lined with a leather-like material, instead of the coarse velvet that lines the AD700 ear pads. The cloth-covered cord, which leads off of the left side earphone, stretches an impressive 10 feet and is terminated with a 1/8-inch mini plug. Here, Audio-Technica has employed a more commonplace 1/8-inch jack and ¼-inch adapter, rather than the threaded type found on the AD700. As a result, we had no problems fully inserting the native connector into our iPhone, iPod Touch or headphone amplifier. 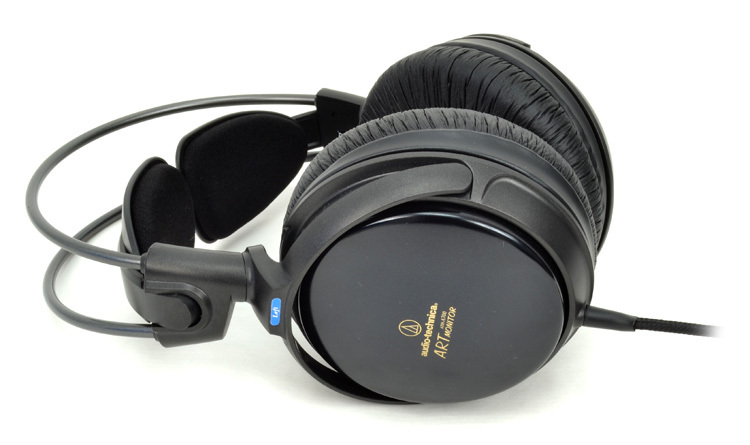 The ATH-A700, like the ATH-AD700, ATH-AD500 and ATH-W5000’s, utilize two “3D paddles” mounted to a frame to support the headphones on the head. The idea is that the paddles should flex to provide just the right amount of resistance at just the right point on the head, so as to minimize wearing fatigue. As such, there is no option for adjusting the size of the headband; it is fixed to the ear-cups. For some reason though, the paddles on the A700 appear to be bent inward and downward at a steeper angle than those found on other headphones in the Audio-Technica line. The extremely large, circumaural (around the ear) headphones still have a slightly bulky feel which may take listeners some getting used to. That said, we think that the headphones are comfortable enough that they are as easily adjusted to as any other large circumaural headphone.